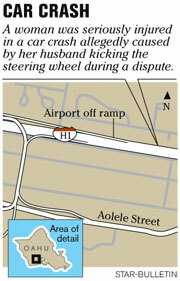 A single-vehicle crash that seriously injured a female driver and closed the H-1 Airport Viaduct for 3 1/2 hours Wednesday night was caused by the passenger kicking the steering wheel, police said. Police said the accident was intentionally caused by the passenger, 32, who was arrested at the Queen's Medical Center at about 12:05 a.m. yesterday on suspicion of second-degree assault. He is the driver's husband. The driver, 28, was trapped after the accident and freed by firefighters. She was taken to the Queen's Medical Center in serious condition, and the husband was in stable condition. Questioning the wife, police were told the couple had been arguing before the husband kicked the steering wheel, causing his wife to lose control at about 7:45 p.m. Traversing all the lanes, the vehicle slammed into a left-side barrier and rolled several times. "Everybody is just very fortunate there weren't more serious injuries," said Honolulu police Capt. Frank Fujii.